French ensemble Trio Wanderer lived up to its name when they made their long-awaited Australian debut by taking its audience on a journey from elegantly classical Esterházy to sweepingly romantic Moscow with a spectacular stop in Prague on the way. 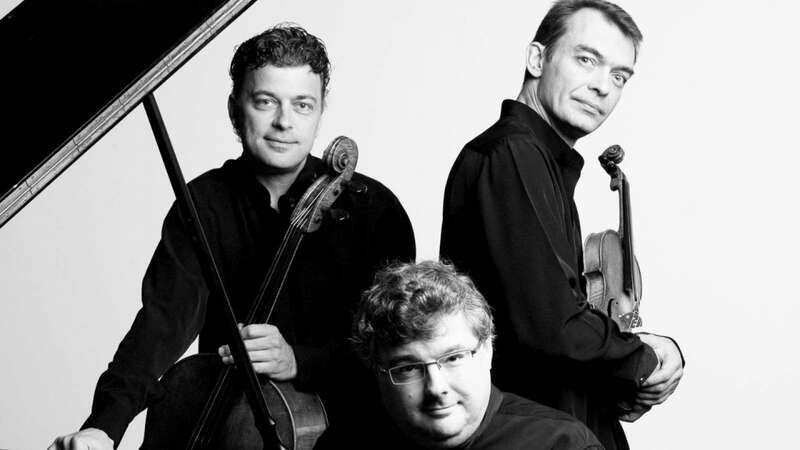 Formed in 1988, and mentored by members of both the Beaux Arts Trio and Amadeus Quartet, the trio’s credentials are blue ribbon and they are a superbly integrated ensemble, borne out by the fact that their newest member, violinist Jean-Marc Phillips-Varjabédian, joined up 24 years ago. Like the other members, pianist Vincent Coq and cellist Raphaël Pidoux, he is a graduate of the Paris Conservatoire. The intimate Utzon Room, looking out on Sydney Harbour on an early winter, sunny Sunday afternoon, was the perfect setting for two hours of consummate music making from a trio who play with all the telepathy and homogeneity that only decades of rehearsing and performing together can bring. The afternoon started jovially with the lively allegro of Haydn’s Trio in C from 1796, one of the final set of three he composed. This is very much a showcase for the piano, with the cello augmenting the piano’s left hand while the violin embellishes on the right-hand melody lines. The noble middle movement showed off the Wanderers’ warm and burnished tone while the quicker outer movements highlighted Coq’s attack, drive and impeccable technique. Pidoux was released from his subordinate role in the next work, Dvořák’s Dumky Trio Op 90, the composer’s fourth and most famous trio in which the cello often leads the action. A couple of years ago Trio Wanderer recorded this work alongside Dvořák’s third trio and this reviewer said that the Dumky performance had too much Gallic flair and not enough Bohemian blood and guts for his liking. No such reservations with this live reading – it was very much on point with lovely lyricism in the slow dumkas and paprika to spare in the furiants. A particular highlight was the lilting fourth movement with the cello lines weaving over the skittish violin and piano accompaniment. The second half featured the perfect complement to the Dvořák in Rachmaninov’s heartfelt Trio élégiaque No 2 Op 9, a “tribute to a great artist”, his mentor Tchaikovsky, and largely modelled on that composer’s own tribute to his friend Nikolai Rubinstein. Rachmaninov’s first movement seems to reflect all the stages of grief, with a falling motif in the piano as the building block for a sweeping passage building to an almost unbearable angry climax before a peaceful, funereal interlude and the return of fury. Coq’s handling of the second movement’s variations on a hymn-like theme – Rachmaninov, somewhat impracticably, wanted it played on the harmonium – was masterful, ably backed by Phillips-Varjabédian and Pidoux’s full-blooded string sound. The finale, allegro risoluto – very risoluto under Coq’s hands – was a pianistic tour de force full of ringing church bells and that emotion on the grand scale that Russian artists manage so well, before dying away to its haunting closing bars. Grace and some spicy paprika from an exciting young Hungarian cellist. Nuanced Bach with strength and elegance from the Canadian violin virtuoso.